In the previous post of this series we built the application service of the demo application. We’re now ready to build the consumer layer. For demo purposes we’ll only build a Console-based consumer where the user can insert the URLs to run and monitor the progress. In reality the consumer layer would most likely be an MVC application which can then be refreshed periodically to get the latest status. Alternatively you can turn to web sockets with SignalR to push the updates to the screen. In our example, however, a console app will suffice to reach the goal of using a Windows service. There’s nothing magic here I hope. We simply build an IHttpJobService from various other ingredients according to their dependencies. 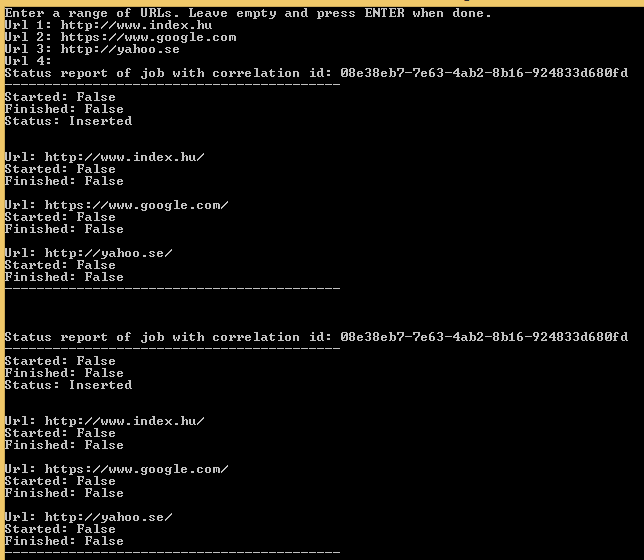 We keep extracting the updated HttpJob until it has reached the Finished status. We wait for 2 seconds between each iteration. After the loop we want to print the final job status. There’s of course nothing that carries out the job yet so the while loop never exits in MonitorJob. We’ll start building the Windows service in the next post.